Currently I am spending much of my career designing and lighting landscapes, and have come to the conclusion that I am much more aware of lighting and its space that light creates. I am on the verge of constantly envisioning the night time scene as I walk amongst the landscape whether it be urban, commercial or residential. With the influx of LED lights gathering populartiy due to its energy efficiency, and longevity in the Landscape. Our tool box is over filling with fixtures of every type, various color temps and a range of beam sprays. The key to a successful night lighting scene is to understand what you are lighting, type of textures reflecting and the message of illumination. Its obvious that a great deal of the outdoor lighting fixtures are hidden amongst, pointed at, and supported in the Landscape. This being said the more you understand about the Landscape and its plant types and how light will interact off such plant textures throughout the seasons both day and night. Its this vision during the day which allows you to envision placement of lighting sources to create this night time drama. This award winnning vision and passion for achieving great lighting scenes is what separates the Professional outdoor lighting designer versus the lighting contractor. I could not believe my eyes when I apporached the mall with my better half for a little retail therapy. The grounds of this particular mall were nicely landscaped and well kept. What I found when it came to the lighting was upsetting. Look at this picture closely. There is obviously alot of money spent on the Lighting approach. But oh so wrong. What I am guessing is that the expansion plans came with a set of prints, Landscaping schedule and outdoor lighting. It appears that either the outdoor lighting design was incorrectly envisioned or the planting budget severly cut back at this Lighting Set-up would greatly overcome the trees planted. The irony is that this set up is right out beside an outdoor fine dining establishment. Very visible to the public eye. I just wonder how this projects get awarded or who is the night time finish pointing designer on the project. Probably is none on this project. Quite costly and overkill for the immediate moment thats for sure. If our Blog on linkedin – Landscape lighting professional can help anyone recognize that outdoor lighting and outdoor lighting design is a true profession. 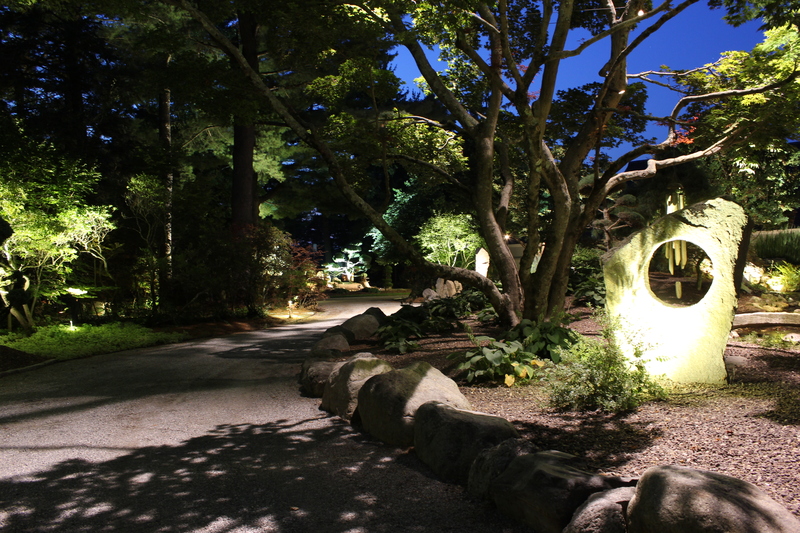 Read the discussion of the GOLDEN RULES of nightLighting. Its most certain that we would point you in the direction of AOLP. Association of Outdoor Lighting Professionals. I am sure that just about every member of the association would love the idea of a crack at this type of Job. 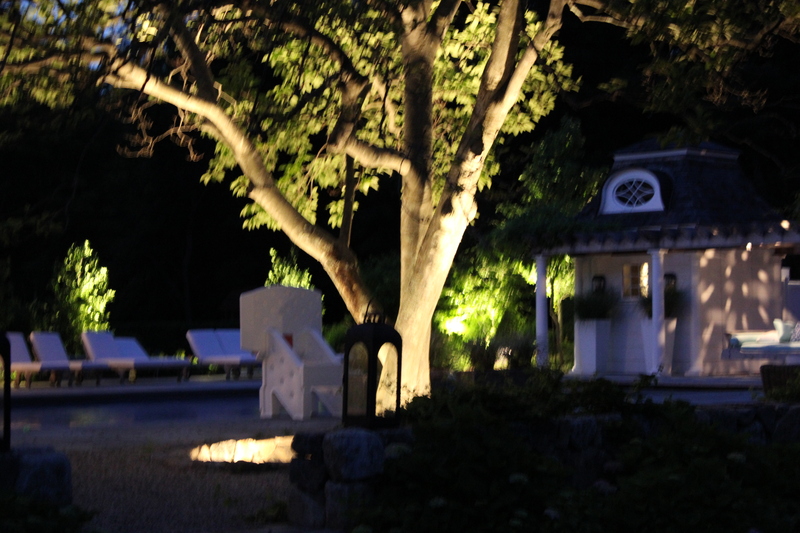 Perhaps we as members of the AOLP can help architects, builders, developers, property owners and clients et all the beauty of nightlighting is further enhanced in the hands of a true outdoor Lighting designer. Outdoor lighting also has Lighting guidelines founded by AOLP which was derived for Outdoor lighting specifications to be greatly utilized for best results. Its imperative one most realize the objective of the Landscape and its surroundings. 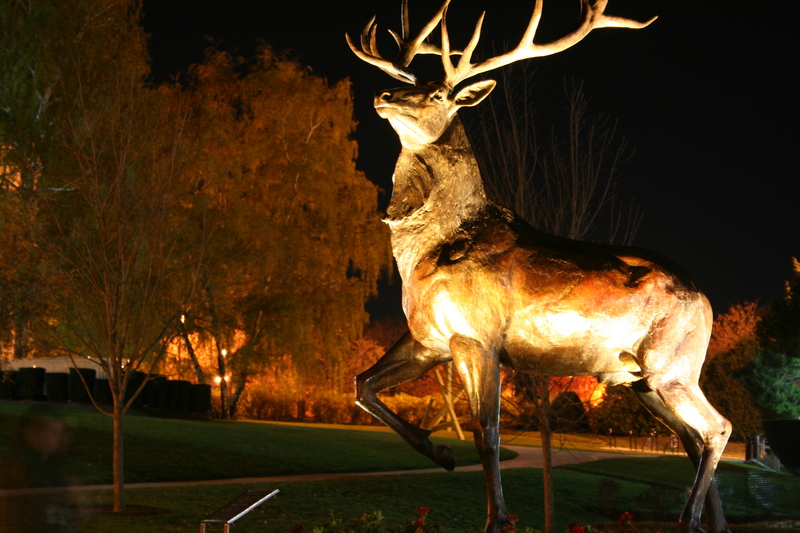 Many times there is perimeter lighting in place for a totally different purpose that competes for light and attention such as in the Backdrop of this FAirfield University STag. After recognizing the backdrop and the feeling for security while walking through campus at all hours of the night, I understood it all wasnt about beauty. The lighting approach was two fold. 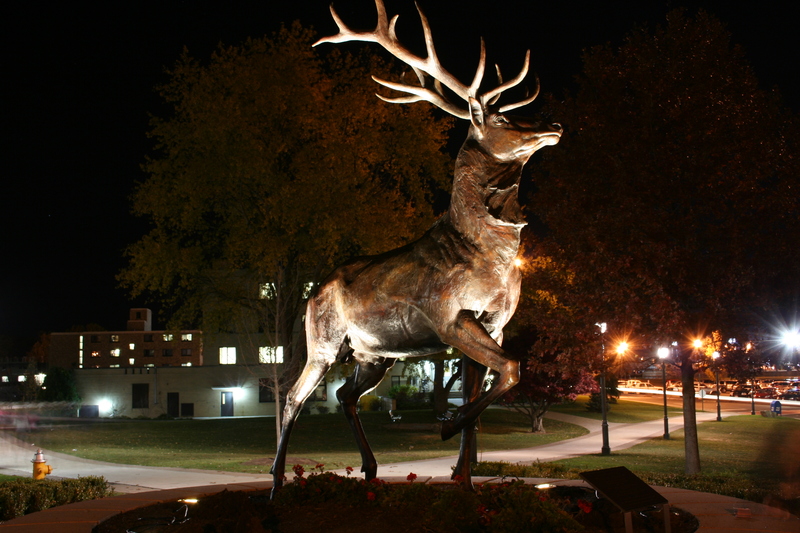 I even went to the burder of finding theatrical film to tone down the stag giving his bronze body more interest and allowing the distinctive perimeter lighting to shine without competing contrast. LED Nightlighting Designer Michael Gotowala of Preferred Properties Landscaping Lights up this FAIRFIELD UNIVERSITY ICON in the middle of Campus. The placement of LED lighting fixtures, The interaction of beam spray and illumination on various textures and type of Light all set the mood for the Night lighting Design you set out to see. Areas that appear normally during the day disappear at night and its the job of a good outdoor lighting designer to illuminate the scene, coordinating levels of light and emotion. Professional landscapes deserves the attention to detail that the landscape plan received. Many times that is not the case because of the gray area of who is best fit for such a task. Licensing requirments limit the selection however, If you search carefully enough you may just find a true Outdoor Lighting design professional who can design and install the outdoor fixtures or opt for a LED lighting designer who can assist in bidding out the installation of such presented design. IF you can get LUCKY enough through referrals or goole for that matter you may just find both a Licensed Landscape lighting professional. All states have them and you can turn to The AOLP- Association of Outdoor Lighting Professionals to help assist you with names of Outdoor Lighting Professijonals. Research their work, view photos and chat with each designer to get a fell for their Lighting design approach. 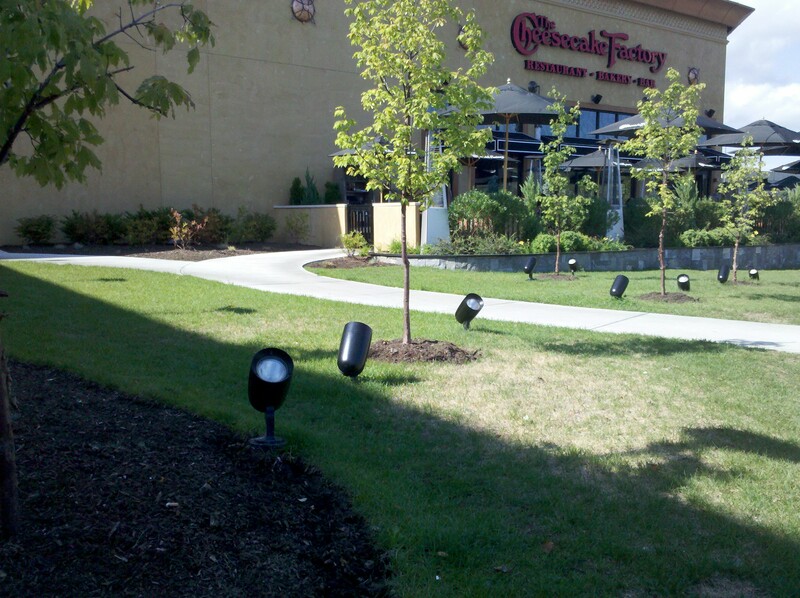 Outdoor Lighting is the perfect accesory tool for expanding the planting seasons four seasons both day and night. Beauty, usefulness, safety, security and Emotion are evident in all award winning Designs. This entry was posted in Featured Projects, how to add outdoor lighting to your existing security system, landscape designer, landscape lighting, landscape lighting design, night lighting, nightlighting, outdoor lighting, Preferred Properties Landscaping, Preferred Properties Landscaping and MAsonry, Uncategorized and tagged led lighting designer, outdoor lighting, Outdoor lighting designs Outdoor lighting designer, outdoor lighting fixtures, outdoors. Bookmark the permalink.